Sorry for not posting this past week, but I had visitors. They flew out of Grenada today. So I have lots to update and it may take a day or two for this to make it up to the web site given the slow internet access I have here. Here is a selfie of the gang. On Thursday when they arrived we had dinner at Whisper Cove (roasted chicken). On Friday I made them go shopping with me. On Saturday we went to St. George's to see the Fort, Market and other stops. After the tour, we had lunch at BB's Crab shack. On Monday we hung around the boat and then went on an evening Turtle watch. This was great, the leatherback turtles lay eggs on the North beach of Grenada. It was a two hour drive each way, but watching a giant leatherback turtle lay eggs and swim back to the sea great. On Tuesday our island tour was rescheduled for Wednesday (good thing cause I only had 3 hours of sleep) so we had an active day with the puppies, lunch (very good Chicken Roti) at Nimrod's, dinghy trips to visit the other Bays, and naps in the afternoon. 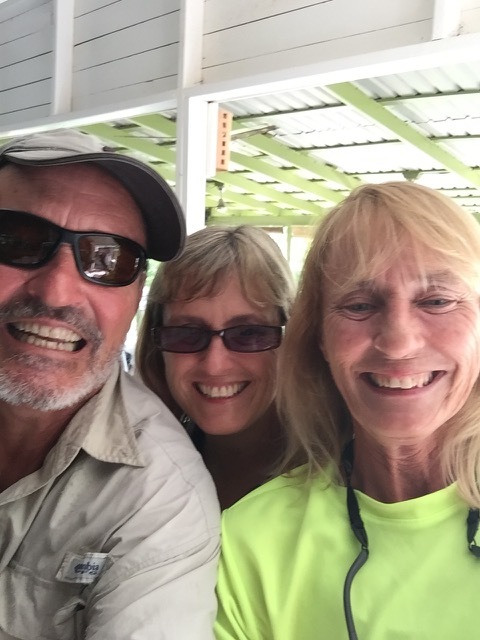 On Wednesday we did an island tour with Cutty (WOW)!!! Highly recommended! The tour took all day and we covered a large part of the island. Cutty is a great guide as he knows everyone and he was once a farmer and knows all about the plants etc. Chances are he saved Julie's life as she was about to pick on a plant and taste it, he stopped her just in time. We went to the Chocolate Factory and a traditional Rum distillery where they still use the water wheel to crush the cane. 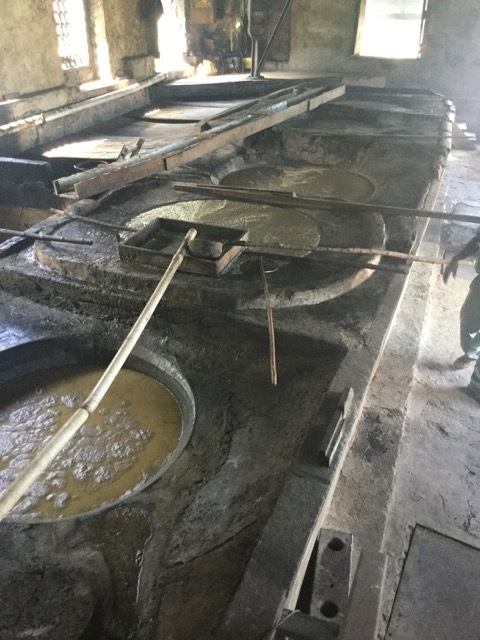 The picture below is the cane evaporation process where the boil off some of the water. Each one of the kettles is 600 Gal and they use the dried cane remains after crushing to fire the furnace under these pots. All the rum they make here is OP (over proof) and not sold outside of Grenada (I don't think they can keep up with local demand). This Rum cannot be carried on air planes (over 70% alc.). At the end of the day they went to a resort for an overnight stay. On Thursday I met them for lunch and took them to the airport.